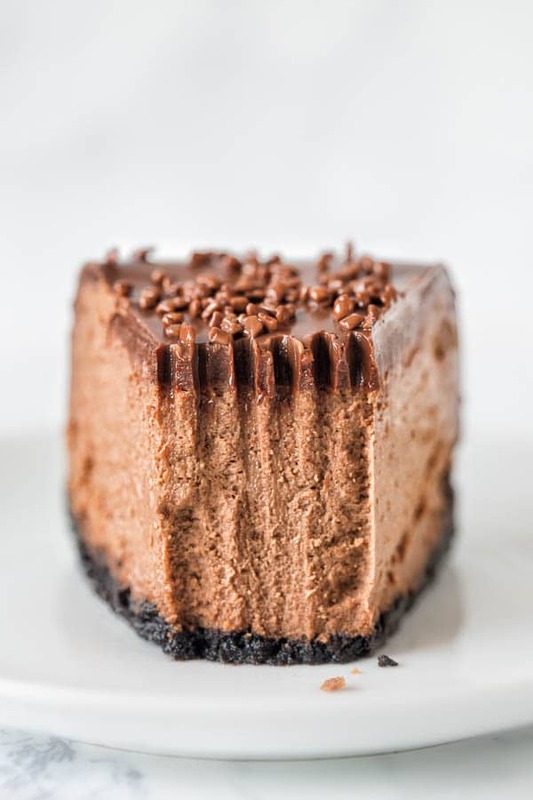 Insanely decadent chocolate cheesecake for your indulgence! 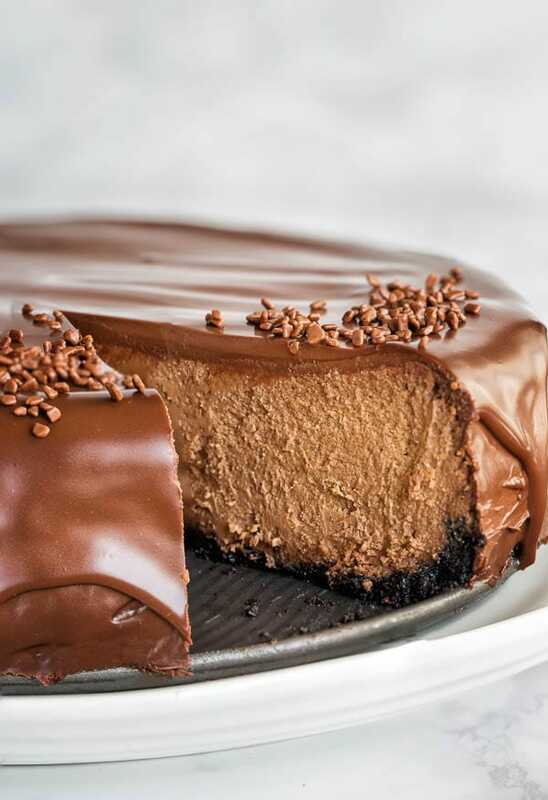 It’s like biting into creamy chocolate truffle, but in a cheesecake form. Oh my gosh, are you drooling? Because I sure am. Too bad I polished off the last slice of this heaven earlier today. You know me, chocolate is my greatest weakness. And when you add it to the creamiest cheesecake, the combination is simply irresistible! But I’m happy to reported I didn’t eat the whole thing by myself. I mustered every bit of discipline and brought it out to the ranch, where it didn’t get a chance of surviving more than 2 days. 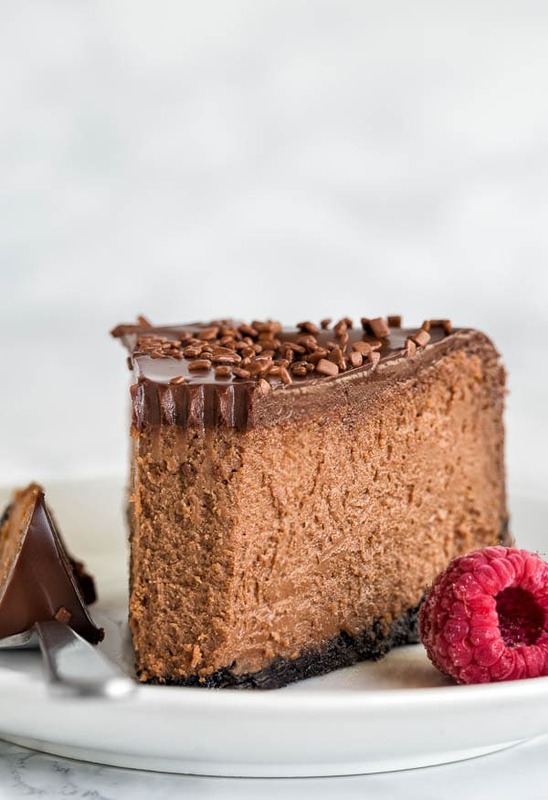 This cheesecake is everything: rich, creamy, moist and dense, just how an amazing chocolate cheesecake should be. And it’s infused with chocolate in every layer: in the crust, the filling and the topping. And we’re talking Oreo cookie crust – the best yet!! No, no skimping on chocolate here, that’s for sure. I seriously wish I could pass a fork to you so you can take your first bite right now, right here. But the technology isn’t there yet (and I really hope it’ll be soon! ), so you’ll just have to get in the kitchen and bake it for yourself. 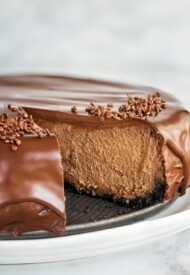 And before I let you go, let me tease you with a few more images of this marvelous cheesecake. Hope you’ll make this cheesecake soon, and let me know if you do. Thanks for reading! Preheat the oven to 350°F (177°C). Wrap 9-inch springform pan with double layer of aluminum foil. In a small food processor, process the cookies until fine crumbs. Add melted butter and pulse until well combined. Press onto the bottom of prepared cake pan. Bake for 10 minutes. 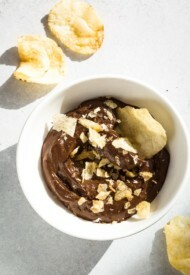 In a microwave-safe bowl, melt the chocolate chips in 30-second increments at 50% power until nice and smooth. In a large mixing bowl with whisk attachment, beat cream cheese until fluffy. Add sweetened condensed milk and beat until smooth. Add sour cream and give another good stir. Then stir in flour, espresso powder, vanilla extract and salt. Add melted chocolate. Mix until smooth, 1-2 minutes. Bake for 55-60 minutes, or until the center is almost to set. Open the oven door ajar and cool for an hour. Remove the cake on wire rack, and then in 10 minutes carefully run a knife around the edge of the pan. Cool until room temperature, and then refrigerate for at least 2-3 hours, or preferably overnight. To make the ganache, heat heavy whipping cream in the microwave until hot. Pour it over chopped chocolate. Let it sit for 2 minutes and then stir until smooth. 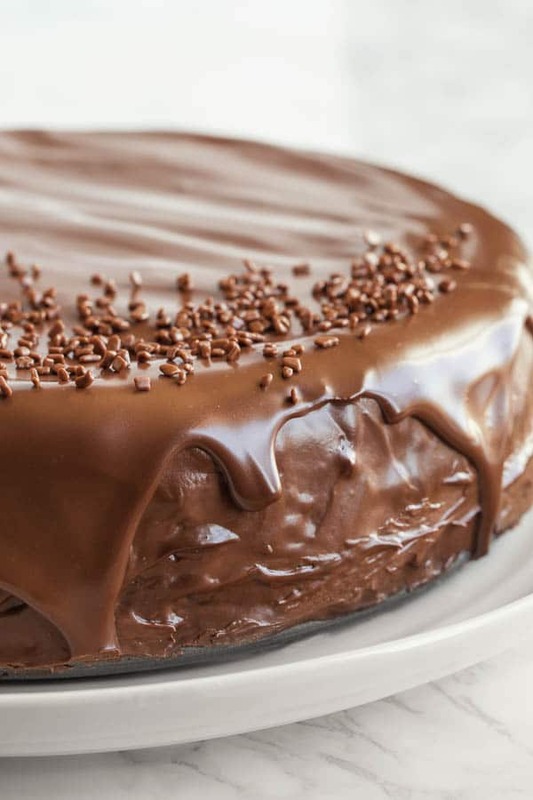 Immediately pour the ganache over the cheesecake. Chill until set and serve. Jus made this and it turned out great except my ganache was really runny. I heated the whipping cream until it boiled then poured it over the chocolate chips n whisked it but it didn’t thicken 😔 any tips? Khadija, sorry for late response. The ganache thickens as it cools. Hope it turned out well, and you enjoyed the cheesecake. Im making this today, can you please telll me what the little chocolate bits are on top? TIA! Hi, there! It’s just chocolate sprinkles. You can decorate with chocolate curls too. Where did you get the sprinkles on top of ganache? Do you use the Oreo with filling, or take the filling out for the crust? Hi, Jordan. In this recipe, I used filling and all. Where did you get those cute chocolate sprinkles for the top? This is my first time making a cheesecake in the oven. I watched the video and I didn’t see foil on the pan. What do you mean by wrapping the pan in foil twice? Hi, Maria. My video was out of focus and I didn’t include it in the final video. But I uploaded it to youtube for you. Take a look. It should look like that. Basically, you lay out a sheet of foil and put your pan on it. Wrap the pan and do it twice. Hope this helps. Let me know. In regards to the chocolate, Is that 30 second increments, not minute right? Oh my gosh, yes, 30-second increments. Fixing it now. Thanks for pointing it out to me! When you add the sour cream into the filling? Hi, Lele. Thanks for catching that error. Sour cream goes in after the eggs. I updated the recipe now. Hello I am allergic to eggs do you have to have eggIess cheesecake? What would you use instead? Most of my cheesecake recipes call for eggs, but these no-bake mini cheesecakes have no eggs. Let me know if you give it a try. Love it! Pinning to try it! I would give anything for a slice of that right now! 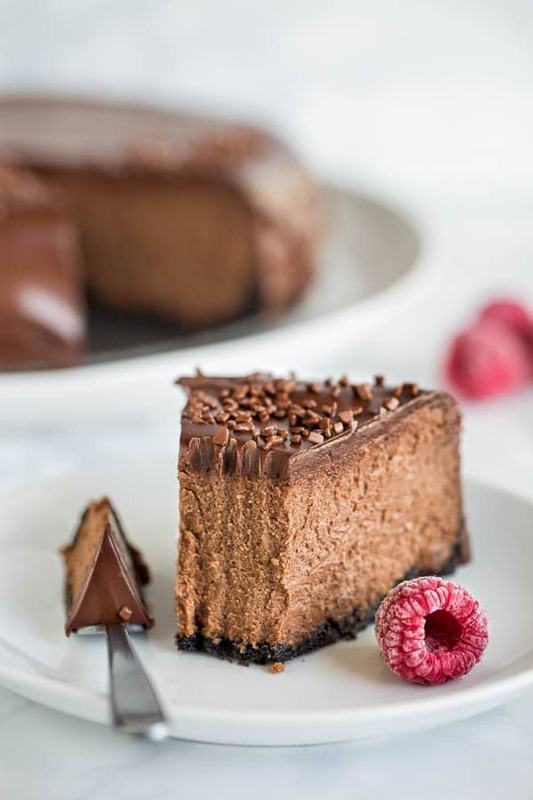 This chocolate cheesecake is a chocolate lover’s dream!! Thanks for sharing!!! Agreed!! Thanks for stopping by, Jocelyn!